This is what we do. 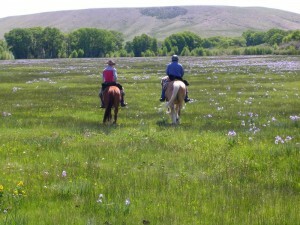 Find the perfect Wyoming horseback riding vacation at the Vee Bar Guest Ranch. The Vee Bar’s horseback riding program is second to none. You will be matched with one horse for the duration of your stay. The Vee Bar wranglers will work with you to make sure you are comfortable on your horse. Every rider will have the chance to progress as he or she becomes more comfortable on their mount. Riders are not asked to ride in an uninspiring head-to-tail line. Loping rides are offered for those who are interested, and the terrain varies greatly! Rides leave the main barn at the Vee Bar, go through the lush meadows in the river bottom, or up onto high plateaus overlooking the valley, including the Vee Bar Ranch. Later in the week, a few rides start on a neighboring ranch and traverse through more mountainous country. Cattle work is a highlight each week when guests help the wranglers move cattle from one pasture to another, sort, and doctor cattle. All rides are adapted to any level of experience so nobody will miss a thing! 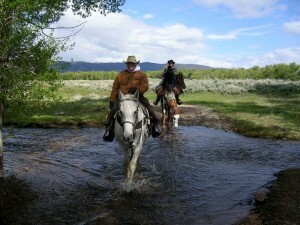 This truly will be the Wyoming horseback riding vacation to remember! Most rides will be split up into small groups of less than 8-10 people. The dynamics of each group are taken into consideration each week, which means the groups are very fluid and do not stay the same all week. Sometimes family groups of varying riding abilities will ride together, sometimes all the kids from different families will be together, and any combination in between works for us. Groups that are composed of varying riding abilities go out on the trails with more than one wrangler so that those who feel a need for speed can be just as satisfied as those who are on the ride to sight-see. Our wranglers have a watchful eye and will offer you tips to make your riding experience the best it can be. They will work to make sure you have a fun and safe riding experience. The Vee Bar is also Horse Safety Certified by the Dude Rancher’s Association. Your safety is our priority. 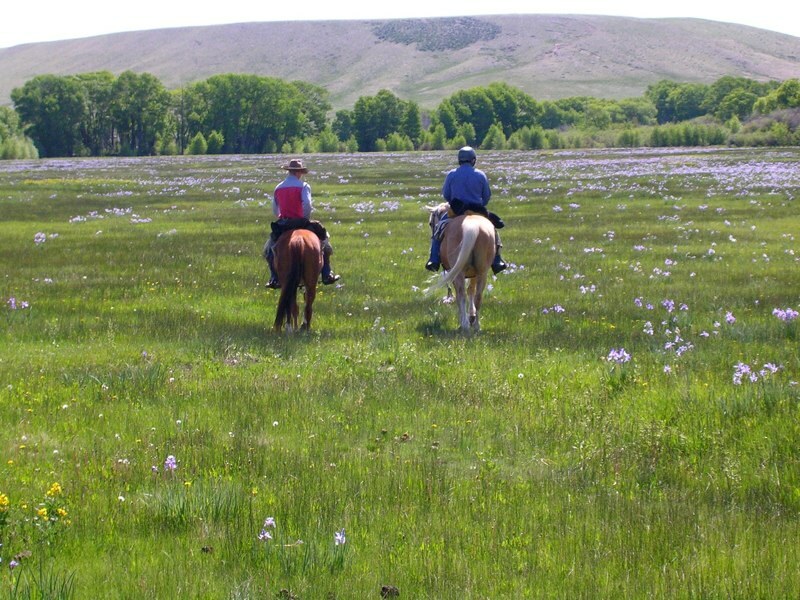 We don’t want anything to spoil your perfect Wyoming horseback riding vacation! Kids 6 and older are welcome to go on all the rides. The Vee Bar has been successful in making horse-lovers out of the most timid riders, and providing a fun, challenging experience for the more advanced kids. Our wranglers are kid-friendly and will take care to make sure your kids have a safe adventure out on the trail. There are several opportunities for one-on-one attention for kids that need an extra boost or a confidence-building experience. For children younger than 6 years old, there are several opportunities to go on lead-around rides. Just let the wranglers know, or bring your youngster to the barn before the main rides go out. A wrangler will get them on a horse and take them on a lead-around near the barn, around the cabins, and to the fishing pond. 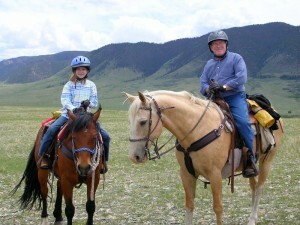 The Vee Bar does not allow a child of any age to ride with the parents on the same horse, whether at the corrals or on the trails. Your kids will remember this Wyoming horseback riding vacation for years to come. The Vee Bar’s horses are turned out to pasture each night and rounded up each morning. This strategy makes for some happy horses, and you will notice it when you visit! The wranglers will begin brushing and saddling horses as soon as the horses are in. 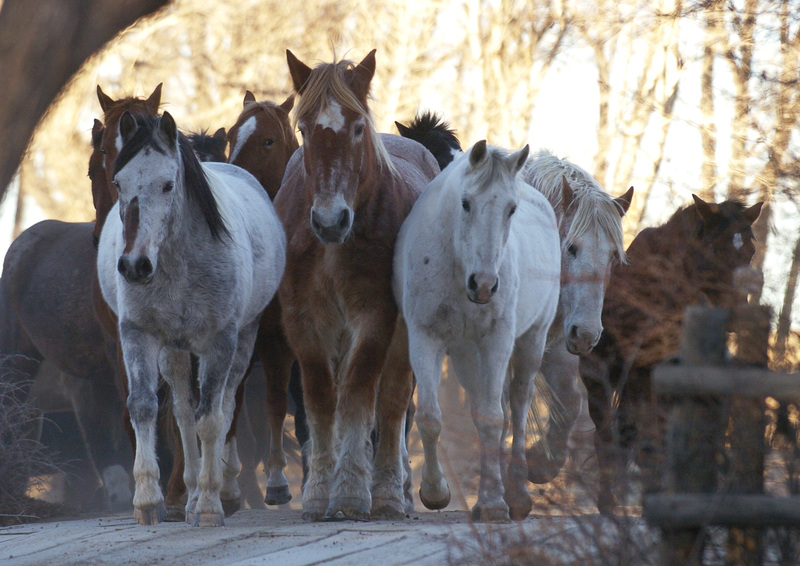 Guests are encouraged to watch the horses come in from pasture and meet the wranglers at the barn in the morning if they want to help groom and learn to saddle their horses. At the end of the day guests can help unsaddle and turn horses out if they want to. Guests are welcome to help as much or as little as they want. Every moment can be a learning moment, so kids especially can gain from this time spent at the barn—that is, if they aren’t already in a river tube on a hot day! 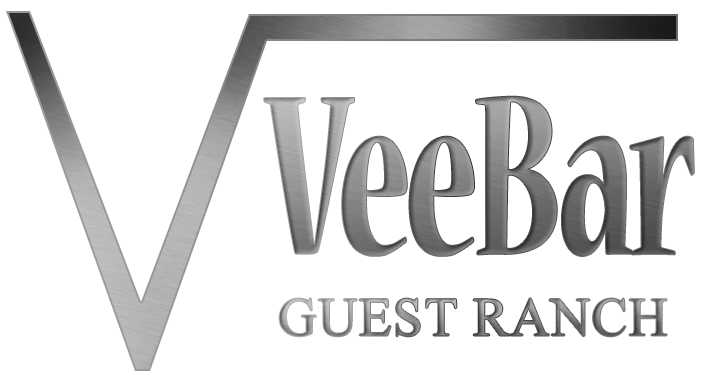 The Vee Bar Guest Ranch is a permittee of the Medicine Bow National Forest and equal opportunity service provider.